ABBOTSFORD — Like the vast majority of his contemporaries, high school basketball coaching isn’t a paying proposition for Bobby Braich. That, however, didn’t stop the veteran coach from making a demand on the length of his term this past summer when he sat down to talk about his position as the new head coach of the Yale Lions senior girls team with school principal Jinder Sarowa. Braich, who had a hand in coaching his own sons Riley and Bradley during their own prolific high school careers at Yale, has certainly helped push the Lions to the upper reaches of B.C.’s top-tiered Triple A world this season. 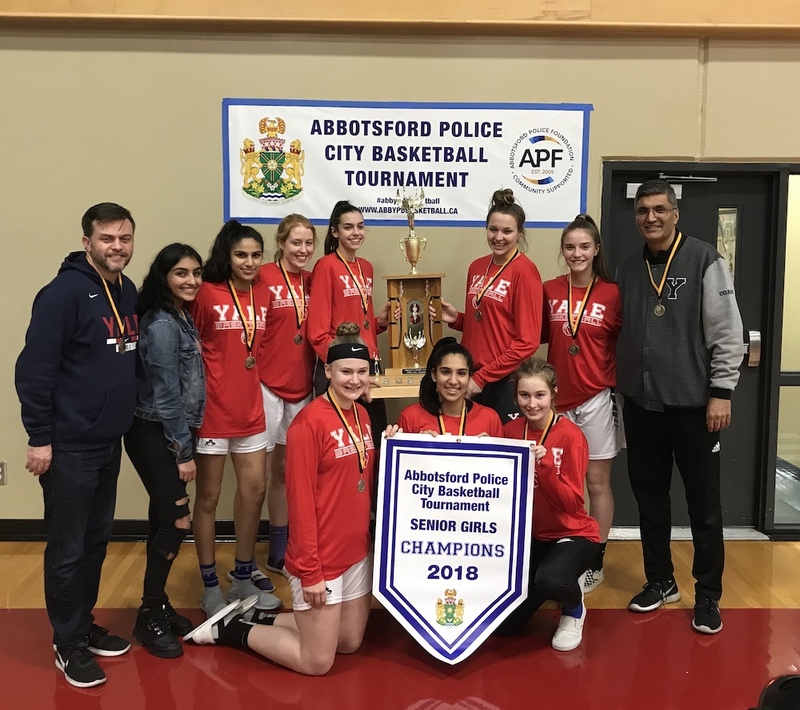 The Lions, coming off a championship finals loss to Walnut Grove and a second-place finish at last week’s Robert Bateman Timberwolves Classic, rose three spots to No. 4 in the latest B.C. Triple A poll. On Friday (1:45 p.m.), the Lions open up two days of competition at Surrey’s Holy Cross Regional Secondary as they face PoCo’s No 3-ranked Riverside Rapids in their opening game at Tessa’s Tournament 2019, the annual tournament staged by the Tessa Beauchamp Foundation. Tessa Beauchamp, a Holy Cross Basketball star, lost a courageous battle with cancer in January of 2012, just shy of her 19th birthday. Her foundation annually awards scholarships to deserving high school basketball players. The tournament runs both Friday and Saturday at Holy Cross, Fleetwood Park and Surrey Christian gyms as well as New Westminster’s Douglas College. On Wednesday, just prior to its game against its crosstown rivals, the MEI Eagles, Yale was scheduled to hold its annual seniors night, honouring its three Grade 12s on what is a compact eight-player roster this season. Guard Tana Pankratz, one of the most explosive players in B.C., along with forwards Brooklyn White and Jessica Daley, were set to be honoured before their final regular-season home games. 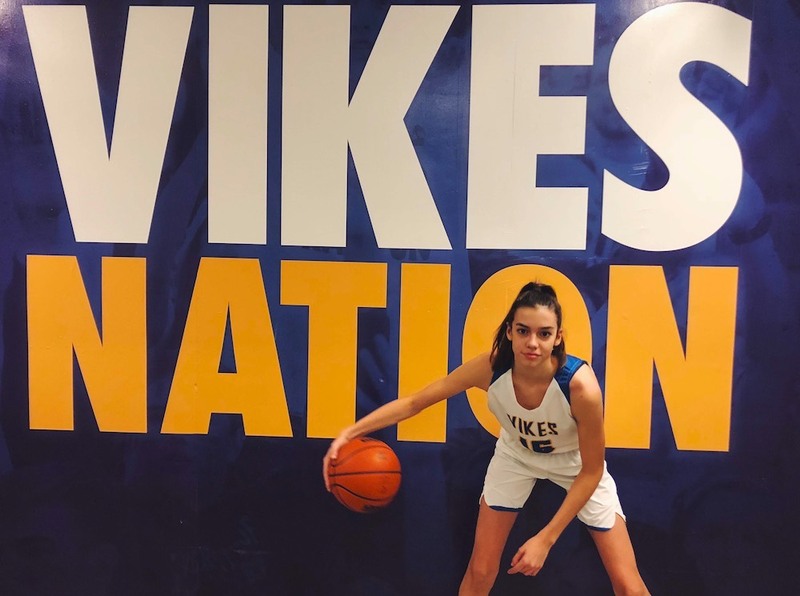 And speaking of next-level talent, Dani Sinclair saw plenty of it, the Victoria Vikes’ head coach set to bring in both Pankratz and White to join school’s tradition-laden U Sports program. 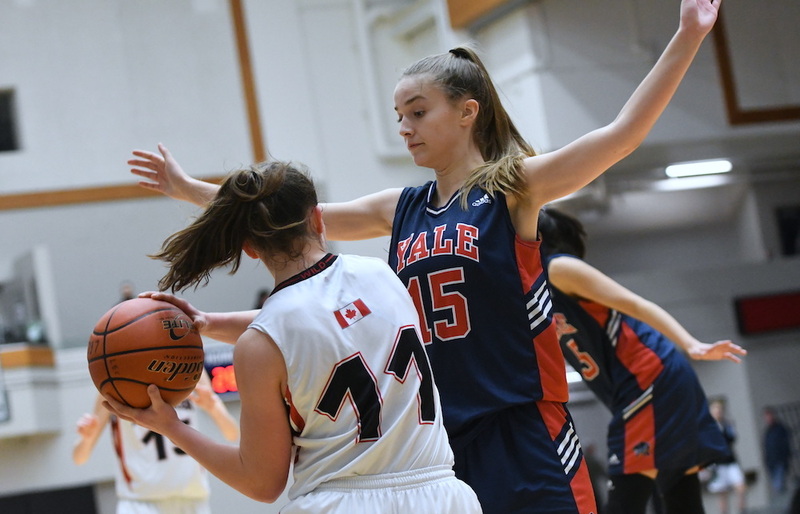 Yet as numbers-challenged as Yale is this season at the senior varsity level, the big-picture bright spot was its ability to allow a talented core of rising Grade 10s to remain together on the school’s JV team, one which last season made the Final Four at the provincial championships. Ask Braich about it, and if not for a fortunate happenstance in which a pair of talented sisters moved to Abbotsford, the numbers situation may have been dire enough to fold the JV team for at least this season. Grade 11 guard Neelam Rai and her sister, Grade 10 guard Karishma Rai, had spent last season with Surrey’s Fraser Heights Firehawks, and had helped lead that team to B.C. JV final where it lost to Walnut Grove. Coincidentally, en route to the final, they combined to score 45 points in the Firehawks’ 68-44 semifinal win over Yale. Braich, who has spent virtually his entire coaching career on the boys side of the game, knew nothing of the pair, but has since discovered the deep generational family ties the Rai family have in Abbotsford. Yet besides the obvious talent the pair brought, their presence alone has been just as important in allowing Yale to field two age-group teams this season. “We have eight this year, but if the Rai’s didn’t come, we would have only had six on the senior team and we would have had to forego the JV season,” explained Braich who would have been forced to purge the current Grade 10 roster of its top players. And how good are the Rai’s? Braich has gotten Neelam Rai, a point guard, to study the game of former Yale point guard great Marek Klassen as it pertains to grasping the flow of play and her ability to help stay a step ahead of the action. Meanwhile, he’s watched Karishma Rai continue her development as a consistent three-point shooter. 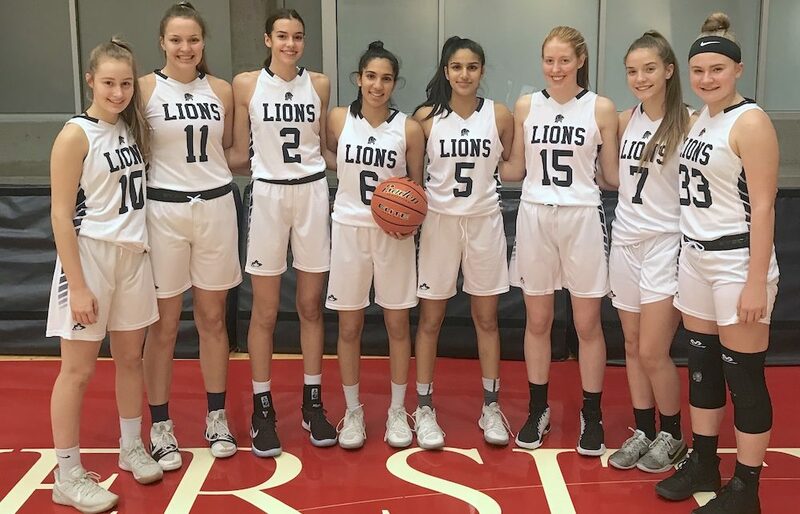 Case in point: While Neelam Rai hit seven treys and scored a game-high 29 points in Yale’s opening-round win over Lord Tweedsmuir at the Bateman tournament, Karishma hit six treys and scored 23 points in the Lions’ 90-71 loss to Walnut Grove in the Bateman tourney final. And speaking of that earlier win over Lord Tweedsmuir, Yale hit 22 combined three-pointers in the contest. They also hit nine in an 80-55 semifinal win over Brookswood and then added 11 more in the loss to Walnut Grove. Just like the Friesens (longtime Yale boys head coach Al, and his son, current UFV men’s head coach Adam) and Braichs, the Pankratz family has a huge lineage at Yale Secondary. If you’d dropped by the gym on Tuesday, in the later hours of the evening, the shooting machine would have been turned on and both Bradley Braich and Tana Pankratz could be seen going through their paces. “Tana is an incredible talent,” explains Braich of Pankratz, whose older brother JJ just wrapped up a collegiate career at Simon Fraser, and whose dad Jay has coaching roots at the school and was also its former principal. Add the athletic White, who is expected to immediately meet the physical side of the U Sports game and continue to improve her skills over its tended five-year window, and the Lions are playing a role in sending a pair of players off to post-secondary careers. Daley and Grade 11 forward Emmy Curtis represent the other holdovers from last season’s senior varsity B.C. tourney qualifier. Guards Kyleigh Boldt and Lily Borseth, a pair of Grade 10s on last season’s JV team, join the senior varsity as Grade 11s to round-out the eight-player roster. FIVE YEARS OR THE HIGHWAY! In a manner of speaking, Braich is happy with his Yale coaching ‘contract’. Over the summer, he held an intense, week-long camp for rising Grade 7s, 8s from its Fraser Middle School feeder, as well as the school’s Yale-bound 9s. So while the senior varsity has thrived, sitting behind only No. 1 Semiahmoo, No. 2 Walnut Grove and No. 3 Riverside in the latest B.C. Triple A girls poll, the Yale JV, allowed to continue its growth this season, was sitting at No. 5 in last B.C. poll. Yet while so much of this season’s story will be written over the coming weeks as Fraser Valley and B.C. tournaments beckon, Braich likes the longterm future just as much.